The challenge for this week involves space and storage planning. Think about your physical classroom space and what part(s) of the room are and aren't working for you. Think about the subjects you teach, and how you store your materials for easy use. 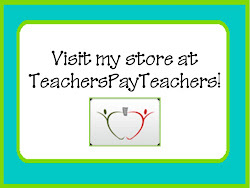 The first thing I suggest doing is creating an ideal layout for your entire classroom. IDEAL. Even if you don't have all of the furniture or storage items that fit in to this idea plan, sketching out a plan will help you itemize the things you still need to make your classroom the ideal space for you. This plan may change over time, but keeping this plan in the back of your head will keep you grounded when you are out shopping and find something that is a great deal, but not a part of your plan. Next, make a plan of how you will store specific items like student books and materials, teacher supplies, community supplies, novels, computers, centers, etc. You'll need to 1.) figure out where you want to keep these items, and 2.) how you will store them to make everything work for YOU and your students. While I keep my students in mind when I create and plan anything, ultimately it has to be something that works for ME because my students follow my lead when it comes to handling and maintaining materials. 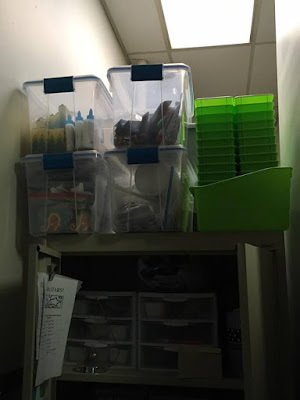 Here are some ways I keep things organized in my classroom. I don't keep a teacher's desk. I use a student table and keep my everyday items on a clipboard and inside chair pockets at my table (since those chair pockets aren't assigned to any one specific student). My 1920s elementary classroom has an old coat closet. I use two large metal storage cabinets -- back to back -- to divide this closet in to two sections. One side of the closet is for students to store their book bags and coats. Since hooks are limited, they are numbered and students are assigned a number. It did mean that I have to call certain numbers to the coat closet first, since some hooks are underneath others, but the kids are pretty good at getting it right. And when they pack up? I just call the numbers in the reverse I did in the morning. The cabinet that is on the other side of the cabinet shown below is filled with community supplies. At the start of the year, we ask students to bring in tissues and lined paper. I buy baby wipes in bulk and store them in that cabinet as well. One shelf is solely designated for guided reading books that go with the Journeys series I have in my classroom. Of course there is a sign on the cabinet that just says "Please ask your teacher before getting supplies from this cabinet." It has not been an issue. This cabinet faces my "teacher side" of the closet. Students do not go inside this side of the closet unless I ask them to get something. Extra bins and other supplies are stored in clear bins so they are easy to find. Items that I need regularly -- like staples and dry erase markers -- are kept in an over-the-door shoe holder on the swing door to the closet. At the entrance of my "teacher side" of the closet, there is a wide section with one built-in closet with no doors. 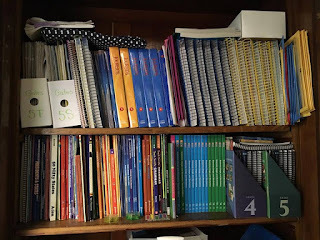 This is where I keep any teacher guides that I use all the time, or books that I cannot get rid of because they go with the curriculum materials that belong to my grade level(s). 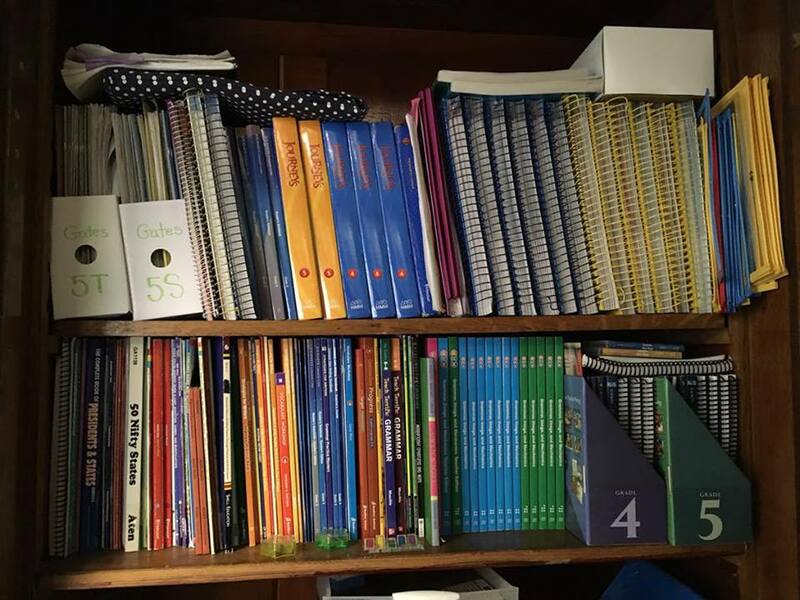 I am lucky to work in a building in which I can choose the materials we use for reading instruction, so I do keep my student Journeys books on a cart by the door. Those books are only used periodically. The majority of my reading instruction comes from novels/trade books. Over the years I have really built up a large selection of class sets of these books. Due to large class size caps in my district, I have 34 copies of each book in each of these bins. 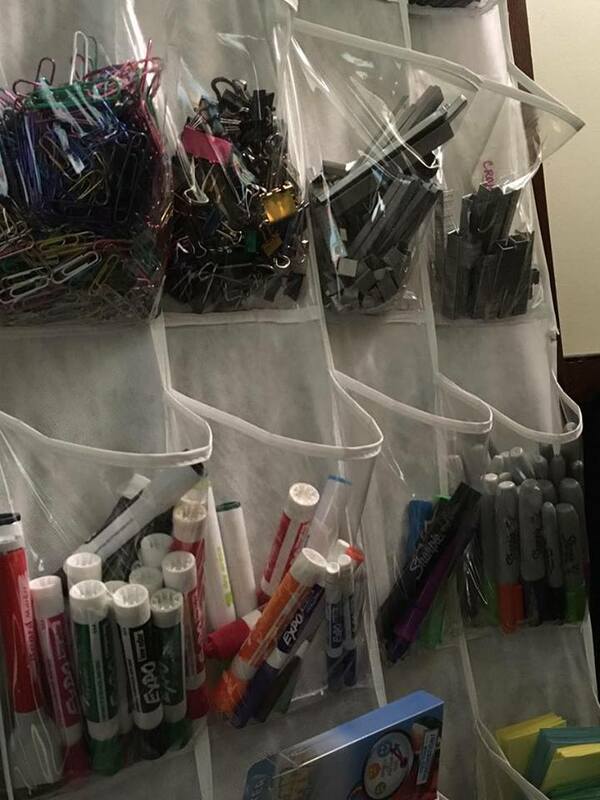 If I had to pick one organizational method that makes the most sense for my room, it is the purchase of these bins. 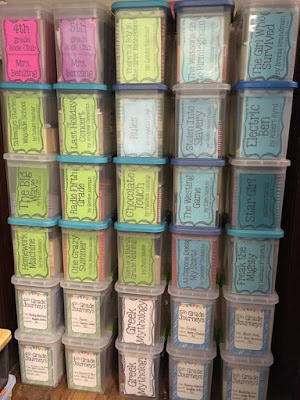 *Bins with green labels are 4th grade titles and blue labels are 5th grade titles. *The pink and purple bins are materials for a classroom volunteer who pulls an accelerated group for me each week. *The bins on the bottom belong to the Journeys series (so they belong to my school). *And I <3 greek mythology, so I hold on to those materials in their own special bins. Anyway, the point of these pictures is to prove that I've made a plan to make my classroom work. People always ask me how I keep things so neat and organized, and the truth is that it works for me because I've made a master plan. This doesn't mean that messes don't happen. I do have to spend time each week putting things away. 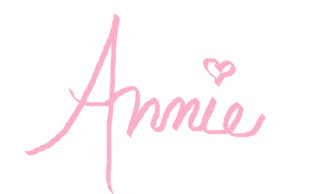 BUT, because I have a place for everything, I know exactly where it all goes.